At some point between Wednesday, May 16th and Thursday, May 17th the whole ceiling at Prive Salon in Ambler came crashing down in the storm due to a roofing issue, and the salon incurred massive water damage. When owner, Kathryn Picraux unlocked the door to her salon on Thursday morning, she was met with a collapsing ceiling and the disaster that followed. It was devastating. Everything she had built and designed when she opened Prive, was now severely damaged. Kathryn was mostly concerned about the comfort of her clients and employees, but it didn’t take long before Anthony and Josie Troilo, her former employers, mentors and owners of Citrus Salon and Day Spa in Blue Bell and Trisha, owner of Barberella Salon in Ambler, all reached out to lend a hand as soon as they heard the news. In no time, Kathryn’s clients, her employees and their clients were re-directed to both salons and worked into their schedules. 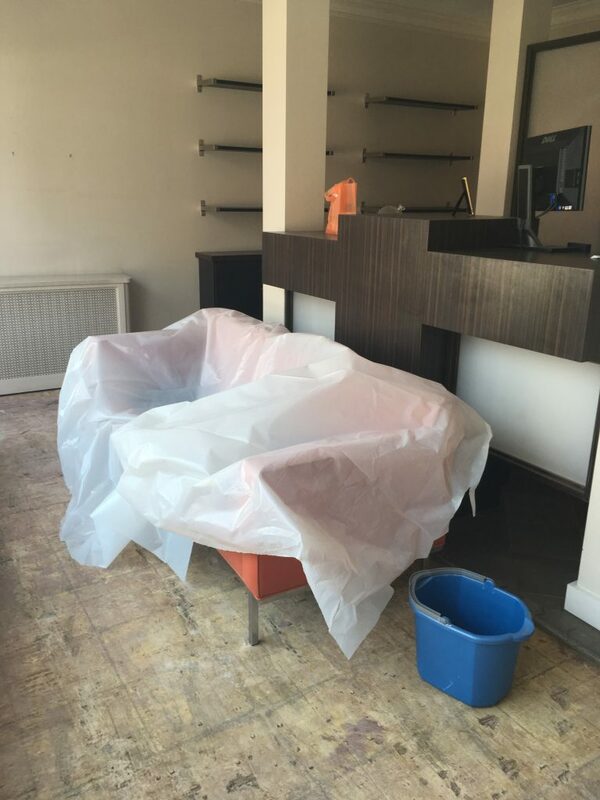 Both salons have gone out of their way to help out in Prive’s time of need, and will continue to welcome clients and stylists during it’s re-building. A complete demo and re-build is necessary and expects to take about another month. But, also in true community effort, Kathryn mentioned that all of the businesses helping with the demo and re-build of Prive Salon are Ambler based, and each reached out immediately to help her build her business back. The best Philly stylists for any—every!—type of hair. For non-Brassy Blondes: Kathryn Picraux attracts clients from D.C., Brooklyn, North Jersey and beyond for her shiny, layered color. One secret? Giving lightened hair the TLC it needs, from a post-color restorative glaze to protein treatments every few months. When we started to discuss putting together a wedding styled shoot, we immediately knew we wanted the shoot to be as pure, raw, lovely and simple as possible. The roll of our bride needed to be both strong and feminine at the same time. The story of Maid Marian and Robin Hood instantly came to mind. Not only is Maid Marian gorgeous, delicate and feminine, but she also has such an independence and strong-will that we couldn’t help but fall in love with. Owner and hair stylist Kathryn Picraux, whose résumé includes stints at New York’s Toni & Guy Academy and celebrity styling at the Grammys, brings her expertise to Montgomery County via Privé Salon. Best known for her color work, Picraux skillfully weaves blonde highlights and hues so natural-looking, they’d make even Jennifer Aniston jealous. 5 E. Butler Pike, Ambler. 2010 CUTTING EDGE DESIGN WINNER! Takara Belmont's 2010 4th Quarter Cutting Edge Design winner is Prive Salon in Ambler, PA! Prive opened their doors just 10 weeks ago. The unique sense of privacy in the space is something customers and stylists love because everyone feels as if they're in their very own salon which helps build long-lasting, trusting relationships with each other. Featuring: Rollerball II; Sara Shampoo Units; Odin Styling Chairs; Millwork recommended by Takara Belmont. Services: Salon woodwork designed and sold by Takara Belmont, approved concepts by Jackie Patterson, Prive's interior designer.